for students, the chance to make a mess and to explore greater surroundings whilst making lots of noise, - is not only appealing, but benificial for them to let off steam. it may be simple, but the very fact that the outdoors is a completely differnt enviroment from the classroom is positive mentally and emotionally for students. Some schools and centres offer grounds with a variety of learning enviroments while others still have huge potential for development. A large area isn't always required in order to achieve excellent outdoor learning. Teaching in your grounds can be a lot easier with a few simple steps. Why not start by looking at our Outdoor Classrooms, specifically designed for Outdoor Learning. 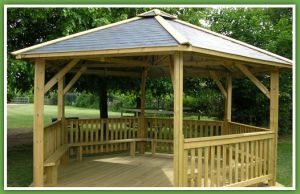 Handcrafted Wooden Products manufacture 4m and 6m diameter gazebos which are ideal for use as outdoor classrooms for schools, playgroups and nurseries. They come with internal seats and have a number of roof and side options. Our popular gazebo used as an outdoor classroom has a capacity of around 30 pupils . The hexagonal design of the shelter works well as a teaching area and helps teachers to keep the children's attention for longer. Teachers have given us very positive feedback on the use of our gazebos as outdoor classrooms for schools. Various accessories can be added as well as two gazebos being linked together to provide for bigger groups of children. For topics and lessons related to the environment this is the ideal shelter. Some schools have strategically placed the outdoor classroom in their nature area or conservation area. Please contact us to discuss your special requirements. We look forward to hearing from you.